Looking at the possibilities in SMS Marketing facilities, Mobile Operators can now take advantage of the potential market and create a new revenue stream via Mocean Web SMS solution. 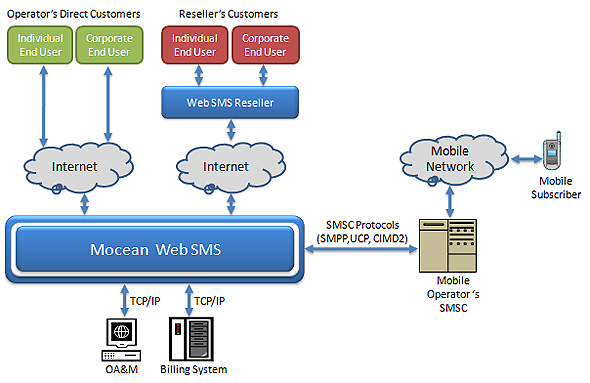 Mocean Web SMS solution is a full featured SMS Marketing platform that allows a Mobile Operator to immediately provide such a service in their network. Application Service Providers are already providing services to businesses. SMS Marketing facilities business model is also very similar to their existing model and more importantly, they are able to target their existing customer database. An additional revenue stream with close to zero hardware & software overhead will be attractive to them. Marketing agencies’ customers are people whom are serious about marketing their products and services and recognise the importance of promotional activities. This provides for an immediately available customer base. ICT Vendors are providing businesses with all types of ICT products and solution to meet their requirements. SMS Marketing can be another additional product carried by the company as an additional solution to present to businesses that is being serviced. Any new setup that wants to go into the ICT industry with limited budget can be a potential reseller. With hardware and software for SMS Marketing already available, their OPEX will be very much into human resources, allowing for higher profitability. Direct Sales Companies are always on the lookout for new products for its members to sell. SMS Marketing can potentially be packaged as one of the many products that are being carried by the company’s members. Existing customer database provides for ready potential market.